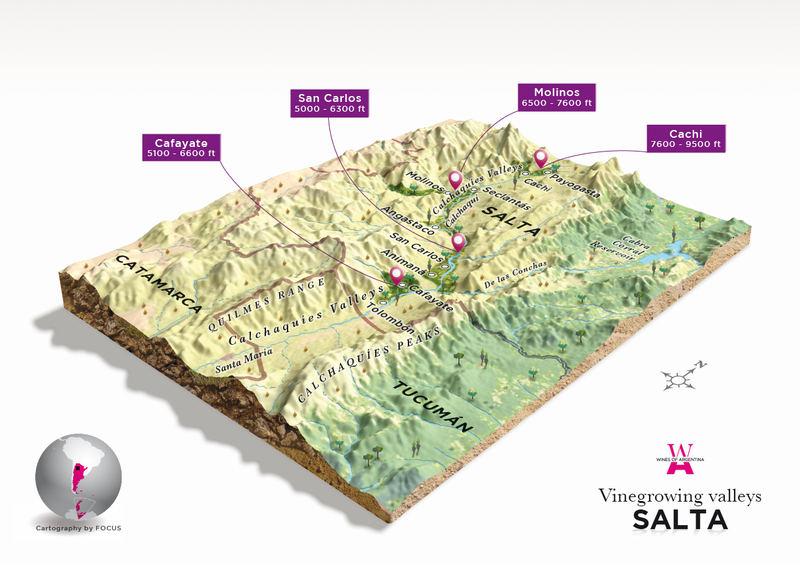 Salta is located at 26° 23’ latitude south and 68°33’ longitude west. The most outstanding wine region is Cafayate, in the so-called Calchaquíes Valleys, and it concentrates 70% of the vineyards in the Valley. It has more than 7,900 acres of vineyards, 99% of which are devoted to the production of fine wines. The grape-growing area starts at an altitude of 4,900 feet above sea level and extends beyond altitudes of 6,500 feet to reach 10,210 feet high, which makes this the highest grape-growing region in the world. Cafayate possesses a special climate, suitable for the plantation of grapevines. Its vineyards have sunlight exposure during almost every day of the year. Located over 1700 meters above sea level, this region has sandy-loam soils made from thick grains with gravel and fine sands on the surface. These characteristics are similar to the layers of subsoil but with fractions of finer sand located deeper and with presence of round stone. It has mild, amenable weather with pronounced thermal amplitude. The latter causes plants to relax during the night and continue synthesizing color mater, aromas and flavors. This makes up for wines of excellent color, intense aromas and lively flavors with mature tannins. Both white and read varieties stand out for their fruitiness, as well as for their varietal authenticity.